Can You Hear Me Now? Stem Cells Restore Hearing In Deaf Gerbils – When Will It Work On Humans? 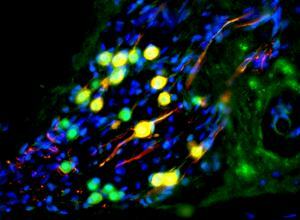 Human embryonic stem cells, induced to become auditory neurons (yellow), were implanted into gerbils. Replacing damaged auditory neurons allowed the gerbils to regain most of their hearing. In a new study, scientists were able to restore partial hearing to deaf gerbils by implanting human embryonic stem cells in their ears. 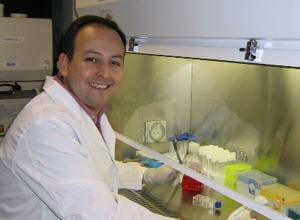 The breakthrough offers hope that one day a similar treatment may be developed to cure hearing loss in humans. One cause of hearing loss is auditory neuropathy, the impairment of auditory neurons that normally transmit sound signals from the ear to the brain. Researchers at the University of Sheffield in the UK sought to restore hearing in 18 gerbils whose auditory nerves had been experimentally damaged, by replacing the nerves with new ones derived from human embryonic stem cells. The undifferentiated embryonic stem cells were first subject to chemicals to induce them into becoming auditory neurons. These new auditory neurons were then placed into the gerbils’ ears. Ten weeks later, many of the transplanted cells had grown fibers that reached the brainstem where several relay centers necessary for hearing are found. To see if those fibers helped the gerbils to hear, the researchers played sounds to the gerbils of increasing volume, and used electrodes to determine what volume was needed to evoke brain activity. The gerbils showed improved hearing ten weeks after receiving the stem cells, with a 46 percent increase in sensitivity. The improvement, however, was far from consistent. A third responded exceptionally well, with some regaining 90 percent of their hearing, while another third showed almost no recovery at all. The study was published recently in Nature. The researchers, led by Marcelo Rivolta, consider the study a breakthrough, but think it will be year before surgeons are able to implant auditory neurons into ears of the hearing impaired. The researchers acknowledge, however, that the technical hurdles needed to make that happen are formidable. The location in the human ear where the stem cells need to be placed is extremely small, making the operation very difficult. Over 275 million people worldwide have some form of hearing loss. Of these, only about 10 percent lose their hearing due to auditory neuropathy. The vast majority of hearing loss is not due to auditory nerve impairment, but damage to another type of cell found in the inner ear. These cells have hairs attached to them that vibrate to sound entering the ear. These hair cells act as a kind of microphone for the ear, transforming sound frequencies into neuronal signals that are sent to the brain’s auditory cortex where speech, music, and all other sounds are perceived. Previous work had already shown that human embryonic stem cells can be induced to become auditory nerve cells, but this is the first time the differentiated cells had been successfully implanted. Interestingly, the differentiation factors induced the embryonic stem cells to produce, not only auditory neurons, but hair cells as well. The ability to produce these cells in the lab is a positive sign that, in the future, replacing the impaired hair cells of deaf people could ameliorate deafness in the vast majority of cases. Unfortunately, hair cells require a very specific and precise orientation in the inner ear to function properly. Placing those cells correctly within the ear would be a phenomenally technical challenge, probably beyond our current capabilities. However, cochlear implants requires a functional auditory nerve to work, so the ability to implant a new auditory nerve would open the door for a subset of people for whom cochlear implants was not an option. Stem cell research may be near to delivering on the medical promise that so many of us are hoping for. Just this year stem cells were used to grow new teeth and improve the vision of patients. Again, it will undoubtedly be years before the auditory nerve procedure will benefit the hearing impaired. But when it does, it will be music to their ears, and the field of regenerative medicine as a whole.